Bahraini women shout "God is greater" Friday, June 3, in a Shiite Muslim neighborhood in Manama, Bahrain, shortly after riot police dispersed anti-government protesters who began a march after the funeral of a woman they claim died of tear gas inhalation Thursday, (AP). In a poor district of Bahrain's capital, a few hundred people marched through cramped, crumbling alleyways banging pans and screaming, "Down with the regime." A mile (1.5 km) away, in the city centre, with its gleaming malls and office blocks, no one heard them. A week after the tiny Gulf island kingdom repealed martial law, and despite the lingering presence of a few checkpoints, much of Manama seems almost back to normal. "Everything is quiet, there's nothing wrong. I haven't heard about any problems," a man who gave his name as Khalifa said as he walked to a Starbucks coffee shop. Not so in the Shiite neighbourhoods where protests first erupted in February, inspired by upheaval elsewhere in the Arab world that toppled longtime rulers in Egypt and Tunisia. "They're saying that security has returned. Look at this, there is no security," a protester said, ducking into a neighbour's home as a sound grenade fired by police shrieked past. Bahrain's Sunni rulers, facing weeks of protests led mostly by its Shi'ite majority, declared martial law in March and drove out protesters from the Pearl roundabout in central Manama. Its eponymous statue, which had become a symbol of the protests, was torn down and the area remains surrounded by barbed wire and dozens of armoured vehicles. The government says the country, which serves as the base for the United States Fifth Fleet, and was to have held a Formula One motor race which had to be postponed in March when the protests were at their peak, is back to business as usual. Shiite residents say that if this is the new normal, tense days lie ahead. "I think we'll remain in this unstable situation until there is some kind of political solution. It's not going back to normal," well-known activist Nabeel Rajab said. Demonstrations are smaller and the battle has been moved onto the Shiites' own turf, but protests erupt unexpectedly like wildfires and police in riot gear race from place to place to snuff them out. In one neighbourhood, young boys climbed onto rooftops to spot the police while older boys erected roadblocks of cinderblocks and trash cans to impede an expected onslaught. 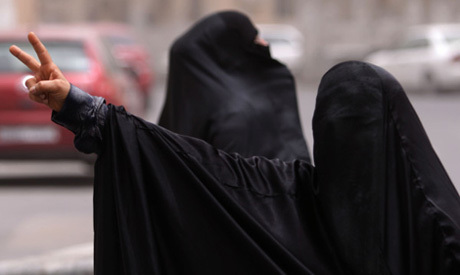 Security forces are determined to prevent a critical mass forming in these protests, ranging from dozens to hundreds of young men as well as women, who hide their faces behind veils. Police try to disperse them with sound grenades and teargas and spray bullets while helicopters buzz overhead. While scenes like this play out in Shiite areas, Bahrain's centre, wealthy areas and Sunni neighbourhoods are serene. Friends linger in cafes or meet for dinner. Traffic jams are caused by people going about their business, not checkpoints. Rianna Eisler, an expatriate businesswoman, said she sometimes hears scuffles at night but feels order mostly has been restored. "We do hear things sometimes, but here it feels normal," she said. "I was afraid when the army left the streets, but it seems safe." The government has said Manama is stable and secure, and is ready to host the Formula One race, pushed back from March to 30 October, even though some figures within the racing community have questioned whether that date will hold. "Things are under control," Sheikh Abdul-Aziz bin Mubarak al-Khalifa, Senior International Counselor at the Information Affairs Authority (IAA), said. He added that King Hamad bin Isa al-Khalifa's offer for dialogue in July offered an opportunity for the opposition to make plans for improving the country. Bahrain has a long history of protests by Shiites complaining of discrimination, especially in housing and jobs. The unrest this year was the worst since the 1990s and some argue the recent calm will not last. Outside his home, activist Rajab has stacked rows of spent teargas canisters, fired by the police to quell protests. "Those are just since last Wednesday," he laughed, his house now a rallying point for protests since martial law was lifted. "There is no single family without a relative who was arrested, fired from their job, or killed," he said, turning serious. "I am afraid we activists are losing the ability to silence people's anger." Sheikh Abdul-Aziz from Information Affairs said the protesters are not representative of the Shiite majority. "They do not even represent a significant minority of the population," he said. "I am not saying they are insignificant, everyone should be able to air grievances. My issue is the way they air it." The protesters say they are peaceful and have wide support, but many who had rallied in Pearl Roundabout are afraid to go into the streets, saying police tactics are hard to overcome. "Our numbers are still small. The problem is they keep firing teargas at us and we have to break up," protester Amal said as she hid from police in a neighbour's house. "We can dodge the spray bullets for a little while, but the teargas is just unbearable, we can't keep moving." As the police moved on, the silence was broken by boys in nearby buildings tapping out the familiar rhythm for the anti-government cheer: "Down, down Hamad (the king)." Amal and her friends braced themselves to go out on the streets again, shouting: "Death to Al-Khalifa." "With every step we take, we'll get closer to Pearl Roundabout," she said. "If we reach it, it means we will have won."